There are quite a few famous Balbis, particularly during the era of the Roman Empire, some of whom are discussed below. Marcus Atius Balbus was Caesar Augustus' grandfather. Julius Caesar's youngest sister Julia (101 B.C. - 51 B.C.) married Balbus, a praetor and commissioner who came from a senatorial family. They had three daughters: Atia Balba Prima, Atia Balba Caesonia and Atia Balba Tertia. 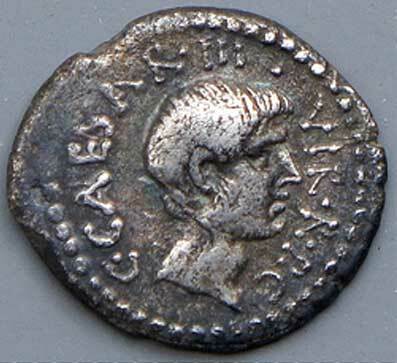 Their middle daughter, Atia Balba Caesonia (85 BC-43 BC) and her husband Gaius Octavius had a son named Gaius Julius Caesar Octavianus, or as he later became to be known, Caesar Augustus. Since Julius Caesar did not have a son, he named his grand-nephew, Octavius as his successor. In 62 B.C. 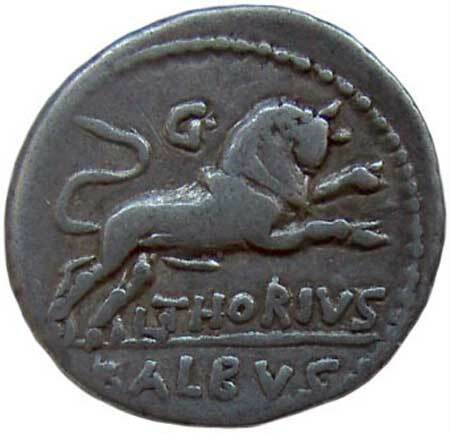 Marcus Atius Balbus was a praetor which was one of eighteen magistrates with judicial functions. He was appointed governor of Sardinia. A coin was minted in his honor. 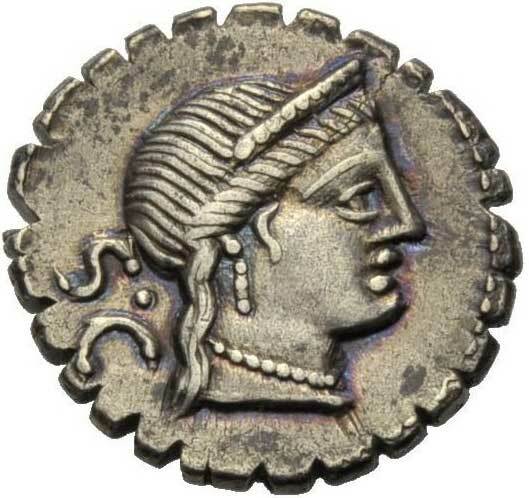 On the front is the head of Sardus, the father or mythical ancestor of the island, and on the back is the head of Balbus. In 59 B.C. Balbus was appointed one of the vigintiviri under the Julian law for the division of the land in Campania. The term vigintiviri refers to an individual who was appointed to oversee the process of founding a colony. Lucius Cornelius Balbus was another very famous Balbi. He was born to a family of nobility in Gades, now Cadiz. He and Julius Caesar became acquainted when Caesar's troops were fighting in France and Spain. Balbus assisted Caesar in this endeavor. He was granted Roman citizenship along with his brother P. Cornelius Balbus and his brother's sons. P. Cornelius Balbus died shortly thereafter. 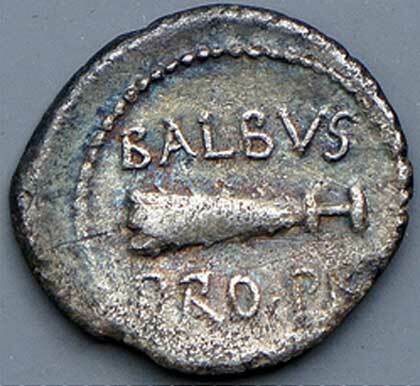 At the conclusion of the war in 72 B. C. Caesar brought Balbus back to Rome where he became a powerful ally. His reported tremendous wealth earned him the friendship of Pompey from whom he received Roman citizenship. Balbus lived in Rome as a friend of Pompey and especially Caesar, whose interests he increasingly attended, ultimately becoming the manager and steward of Caesar's affairs in Rome. In 56 B.C. he was prosecuted for receiving his citizenship illegally. Pompey and Crassus both testified upon his behalf, and Cicero delivered one of his finest speeches, resulting in full acquittal. When civil war erupted, Balbus remained outwardly neutral, although he was Caesar's representative in personal matters. After Julius Caesar's death in 44 B. C. Balbus gave his support to Octavian as Caesar's heir, and was rewarded for this by his election to the consulship, becoming Rome's first foreign-born consul in 40 BC. Wealthy beyond all others, in his will he left 25 denarii to each citizen of Rome. A coin was minted in his honor. 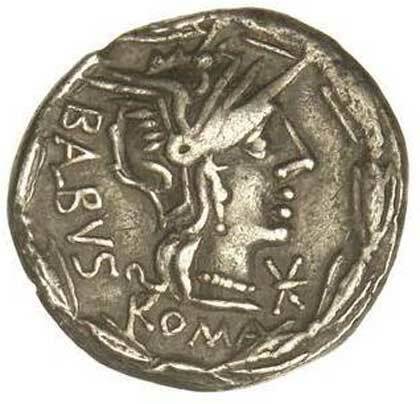 On the front is the head of Caesar Augustus and on the reverse is the inscription BALBVS Pro. Per. Balbus was the author of a diary of the most remarkable occurrences in his and Caesar's life. Unfortunately this document has not come down to us. Some historians believe he was the author of the History of the Spanish War. 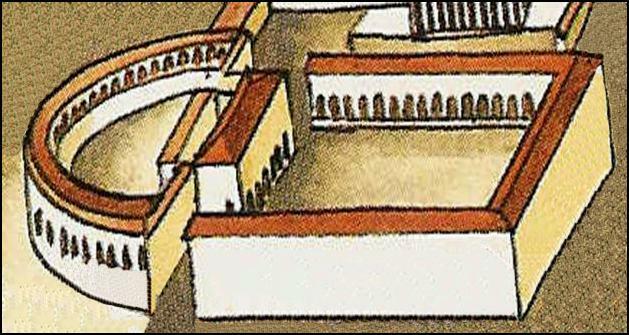 Crypta Balbi originally consisted of a theater, four story building complex and a courtyard. It was one of three theaters in Rome and was constructed by Lucius Cornelius Balbus (minor) between 19 B.C and 13 B.C., in celebration of his victory over the Libyan Gamamantes. In Roman times a theater crypta was a place of relaxation and refreshment between plays. In the crypta courtyard there was generally a temple and also stalls for refreshments. 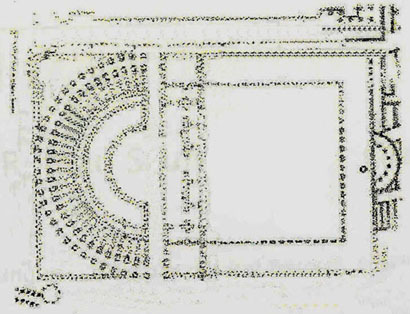 Today the theater portion of the complex is inaccessible as it is located under the palazzi Caetana and Mattei. However, the porticoed courtyard, located behind the stage of the theater has been under excavation since 1981 and is now a museum: the Museo Nazionale Romano Crypta Balbi. Lucius Cornelius Balbus (referred to as Minor to distinguish him from his uncle) was the nephew of Lucius Cornelius Balbus (Major) was born about 50 B.C. He gained more power under Caesar Augustus than his uncle and returned to his home in Gades and rebuilt it. Like his relatives, he gained Roman citizenship and worked actively for Caesar in the civil war. He added a suburb to his native Gades which was called the new city, where he built a harbor. He held the rank of proquaestor in Spain and was later a consul under Augustus. In 21 B.C. he received his greatest opportunity when he was named proconsul in Africa. In 19 B.C. he fought and defeated the African tribes of Garamentes and had the distinction of being the last general to receive a Triumph in Rome. A triumph was a ceremonial procession of troops and commander through Rome to the Temple of Jupiter Best and Greatest at the conclusion of a successful campaign. Balbus built a theater in Rome, Crypta Balbi, dedicated in 13 B. C. Its ruins are in existence today. Man. Acilius Balbus was a Consul in 114 B.C. 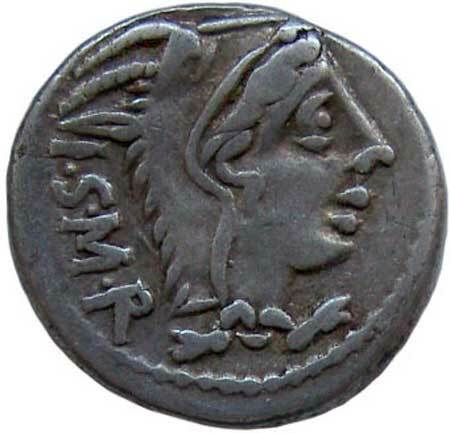 A Roman coin (at right) was minted in honor of this individual or M. Acilius Balbus, Consul in 150 B.C. 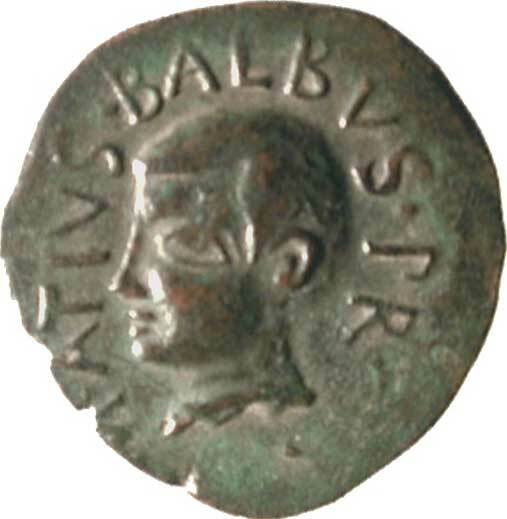 On the front of the coin is the head of the god Pallas with the inscription BALBVS. 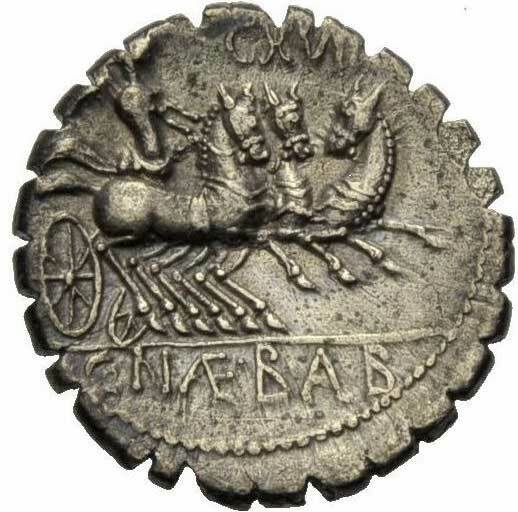 On the reverse is the god Jupiter and a quadriga (a four-horse chariot). T. Ampius Balbus, plebeian, Tribune of the Plebs in 63 B.C. Tribune of the Plebs was a title shared by several elected magistracies and other governmental and/or paramilitary offices of the Roman Empire. It derived originally from the representatives of the tribes into which the Roman people were divided for military and voting purposes. Plebeians was the general body of Roman citizens, distinct from the privileged class of the patricians. T. Ampius Balbus is believed to have written some work on the history of his times; Suetonius quotes some remarks of Caesar's from a work of T. Ampius Balbus. L. Naevius Balbus, plebeian, was one of the quinqueviri appointed in 171 B.C. to settle the dispute between the Pisani and Lunenses with respect to the boundaries of their land. 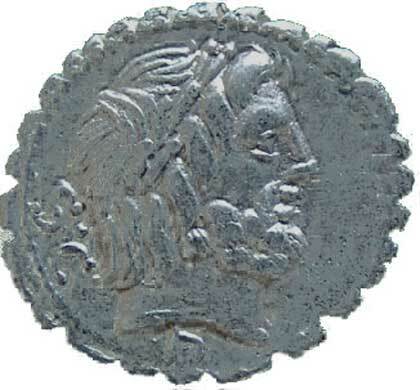 A coin was minted in his honor. On the front is the head of Venus and on the reverse is C.NAE. 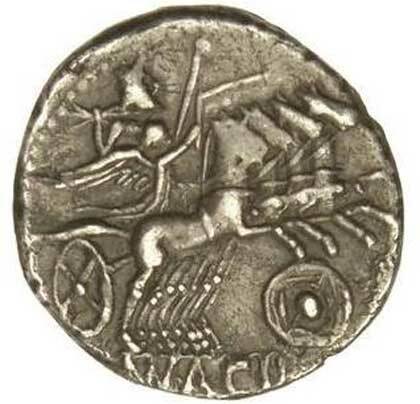 BAB with Victory in a chariot. M. Acilius Balbus was a Roman Consul in 150 B.C. A consul was the highest executive official or magistrate of the Roman People, and president of the senate. At any one time there were two consuls who were elected by the senate. As heads of state they commanded the army, presided over the Senate and assemblies and handled foreign affairs. At the end of a one-year term a consul was generally appointed to serve as a governor of a province. Q. Antonius Balbus, plebeian, is believed to have been praetor in Sicily in 82 B.C. A coin was minted in his honor. 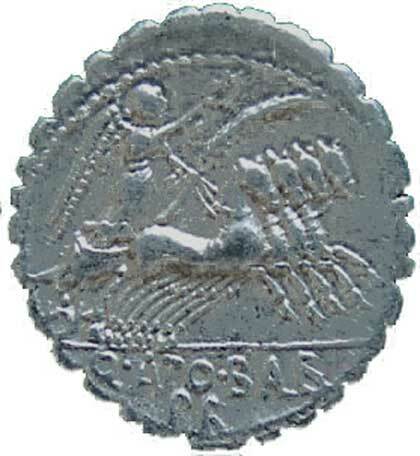 On the front is Jupiter and on the reverse is a quadriga and Balbus' name. L. Lucilius Balbus was a well known Roman jurist. He was one of the legal instructors of Servius Sulpicius Rufus who was an eminent jurist and friend of Cicero. In giving advice and pleading causes his manner was slow and deliberate. He was a man of great learning. Q. Lucilius Balbus, probably a brother of the jurist L. Lucilius Balbus was a Stoic philosopher. Cicero compared him to the best Greek philosophers. C. Thorius Balbus was Born in 105 B.C., a native of Lanuvium. Cicero describes him as a man who lived in such a manner that there was not a single pleasure, however refined or rate, that he did not enjoy. He is possibly the son of M. Aclius Balbus (168 B.C.) 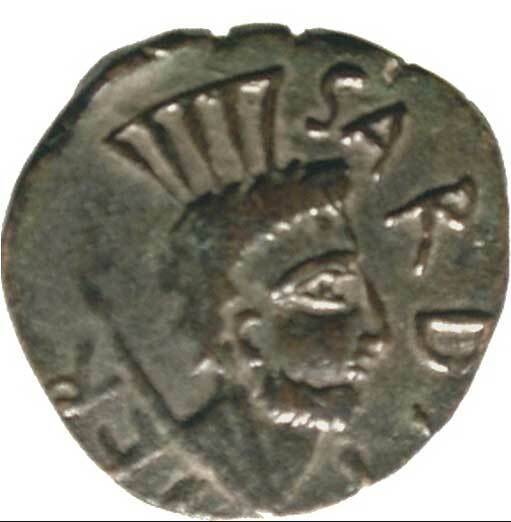 A coin was minted in honor of L. Thorius Balbus. On the front is the head of Juno Sospita, a god whose worship was of great antiquity in Lanuvium, and the letters I.S.M.R. On the reverse is L.THORIVS BAABVS with a bull rushing forward. C. Naevius Balbus was born in 79 B.C. He was a Roman military leader. Gaius Cocceius Balbus was a Suffect in 40 B.C. In the case of the death of a serving Consul, a Suffect Consul would be elected as a replacement for the remainder of his term. D. Laelius Balbus was one of the quindecemviri who oversaw the celebration of the saecular games in 17 B.C. Quindecemviri were the fifteen individuals who had religious duties. They guarded the Roman Scriptures, called the Sibylline Books, and interpreted them when requested to do so by the Senate. They also oversaw the worship of any foreign gods that were introduced to Rome. D. Laelius Balbus was a consul in 6 B.C. Nonius Balbus, plebeian, put his veto upon the decree which the Senate would have passed against Octavianus at the instigation of the consul C. Sosius, a supporter of Antony. Octavius Balbus was a contemporary of Cicero. He was known for his skill in law and attention to the duties of justice, morality and religion. Sp. Thorius Balbus, tribune of the plebs in about 111 B.C. was a popular speaker and introduced in his tribuneship an agrarian law, numerous fragments of which have been discovered on bronze tables. Junius Balbus, a consular, was husband of Metia Faustina, the daughter of the elder Gordian. According to some historians, the third Gordian, who succeeded Balbinis and Pupienus Maximus was the child of this marriage. C. Valerius Flaccus Setinus Balbus: Died in 92 A.D. He was the leading poet of the time of Vespasian. His greatest work was the Argonautica, compiled in more than eight volumes. Domilius Balbus died around 61 A.D. He was a wealthy man of praetorian rank. John of Genoa was a famous Balbi in the early Renaissance period. He was a Catholic priest who wrote "Catholicon" a comprehensive Latin dictionary in 1460. Lodovico Balbi was a 16th century composer and friar. From 1570 to 1578 he was a singer at St. Marco, Venice. He was then appointed maestro di cappella of St. Maria Gloriosa del Frari, later he was maestro di cappella of the Cappella Antoniana in Padua and then maestro di cappella at Treviso Cathedral. He was granted an honorary degree, maestro dell'ordine, denoting particular skill exercised over a long period. Luigi Balbi was the nephew of Lodovico Balbi. He was a composer, organist and friar. He was also a singer in the choir of St. Marco in Venice and later the Cappella del Santo at the basilica of St. Antonio, Padua. He was ultimately appointed maestro di cappella at the church of the Carit in Venice. Francisco Balbi di Correggio (1505 - 1589) was born in the town of Correggio in the province of Emilia, Italy. He was a poet and historian who wrote in Italian and Spanish. He served in the military and fought in the siege of Malta in 1565. He wrote the only first hand history of that famous battle. His book is entitled "The Siege of Malta 1565." Giovan Battista Balbi: He was a 17th century choreographer, dancer, and stage designer. He was involved with Venetian opera from its inception and played an important role in the introduction of Venetian opera to northern Europe. Ignacio Balbi (1720 - 1775): An 18th century composer who performed primarily in Milan. Domenico Balbi: A painter, designer and engraver born in Genoa in 1927. His art exhibitions won awards in Italy and abroad. He created the well known Balbi Tarot Cards and gave numerous conferences about the symbolism of Tarot. He also published articles on metaphysical and philosophical topics.